The southern Great Basin/northern Mojave desert region is home to several different Paiute and Shoshone peoples, all of whom speak languages in the Numic language family. These societies shared a way of life based mainly on harvesting wild plants, following an annual cycle of moving and gathering the seasonally abundant resources. Because of this, they were familiar with and used the full range of plant communities, from the warm-desert Mojave to the cold-desert Great Basin, becoming practiced botanists. They learned which plants and plant parts were useful for curing certain ailments, which produced colorful dyes, which would keep spirits away, and “which crops ripened when” in a particular locality. Native Plants of Southern Nevada arranges that plant knowledge in a traditional field-guide fashion: trees, large shrubs and vines, small shrubs and subshrubs, yuccas and agaves, cacti, herbaceous plants, grasses and grasslike plants, and bulbs. 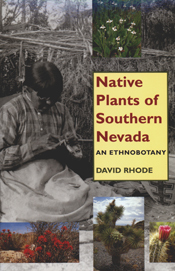 It also lists the native names given by the Owens Valley Paiute, Southern Paiute, Timbisha Shoshone, and Western Shoshone peoples, includes plant description and habitat specifics, and discusses the native uses of each plant. It gathers and compiles the wealth of information buried and scattered in ethnographic notes and monographs, and combines that with good color photographs of the plants, making them easily identifiable in the field. David Rhode is research professor of archaeology and paleoecology at the Desert Research Institute in Reno, Nevada.